While the adverse weather condition in Ireland during Engineers Week 2018 may have deterred our plans to visit our local secondary school, St. Aidan’s Comprehensive School, we were fortunate enough to be invited down for a new date. 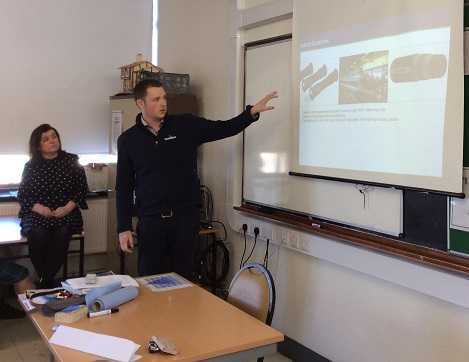 Yesterday, three of our employees spoke with a group of 5th Year students about CavMac’s operations, the importance of engineering and how to enter a career in the sector. The seminar began with a brief introduction of CavMac company history and was followed by details of our manufacturing capabilities. The presenters gave an example of how an engineer uses problem-solving skills in projects by demonstrating the problems associated with Fish Farming Hose and how CavMac solved these problems with innovative features added to our own designed and manufactured Fish Farming Hose. One of the students inquired about the existence of an Engineering Apprenticeship Program in our company, and it was gratifying to see local young people taking an interest in joining our crew. 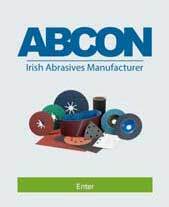 Engineering is one of several careers in Abcon, so having a talk such as this was a great way to introduce them to this and other options for careers with us after the Leaving Cert. 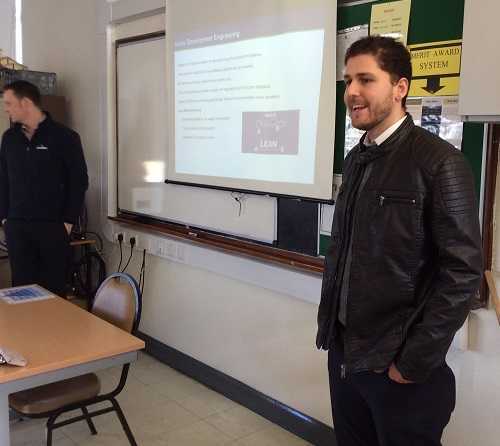 Both of the presenting engineers, Raymond Maguire (Operations Manager for Our Rubber Lining Division) and Cristiano Baeta Neves De Souza (Process Development Engineer) gave their experiences of becoming engineers and what courses and qualifications they pursued and acquired. As the occasion fell on International Women’s Day, our Marketing & Sales Director Lyn Sharkey questioned if any of the girls were willing to apply for any Classical Engineering Degrees (Mechanical, Electrical, Chemical and Civil Engineering). While none had manifested the will to work in these disciplines, some expressed interest in specialised fields such as Biomedical and Environmental Engineering. Engineers Ireland, the organisers of Engineers Week, must be complimented on their initiative to promote engineering to students. We wish that a future engineer from the student audience may say the same of us when they reflect on the talk later in life.